It’s time for universal housing vouchers. Too many Americans live on the edge of eviction. Could this ambitious plan fix the problem? 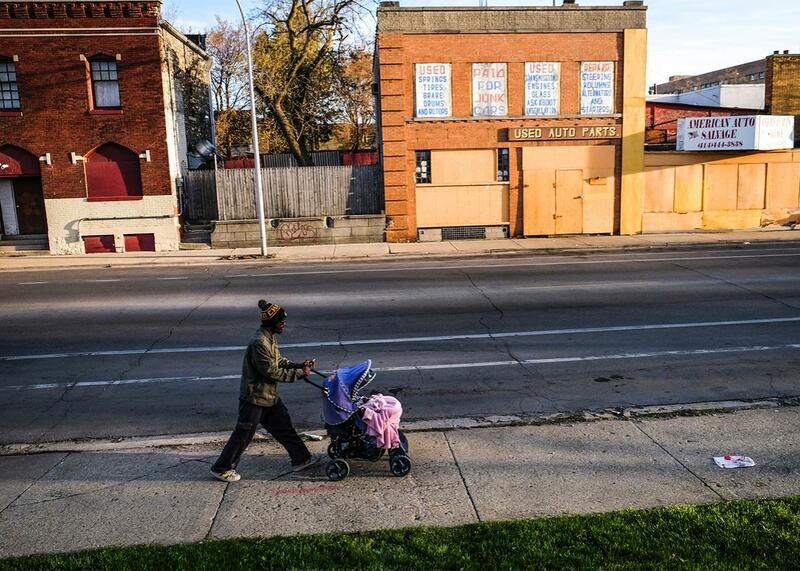 A father and his daughter walk home in Milwaukee on April 28, 2015. Matthew Desmond’s latest book explores housing problems with anecdotes from residents and landlords there. America has never really tried to ensure that all its residents have access to decent and affordable housing. The closest we ever came was in 1949, when Harry Truman signed the Housing Act, which he said would establish “as a national objective the achievement…of a decent home and a suitable living environment for every American family.” Today, that objective is as remote as it has ever been. The consequences have been tragic for many poor families, all the more so because of the invisibility of their suffering. When total costs including utilities are taken into account, a majority of renting families below the poverty line are paying more than half their incomes for housing. “In 2013 between 50 and 70 percent of poor renting families spent half of their income on housing,” writes Matthew Desmond, drawing from the American Housing Survey, in his groundbreaking recent book Evicted: Poverty and Profit in the American City, “and between 25 and 50 percent spent at least 70 percent on it.” In December, Harvard’s Joint Center for Housing Studies released a study showing that 21.3 million households spent more than 30 percent of their income on rent, a 7.5 million household increase since 2001, while those paying more than half their income numbered well over 11 million. Assistance is clearly needed, and the federal government is the only institution capable of meeting that need. Numbers can’t really convey the extent of the pain. Many of these Americans live on the edge of homelessness, perpetually a day away from eviction. Although all would qualify for housing assistance under any rational schema, only about one-third of low-income households receive such aid. While Desmond’s book has inspired comparisons to Michael Harrington’s The Other America, which helped motivate the Great Society reforms of the mid-1960s, the odds of a major housing reform passing are nothing if not remote. The Republican Party periodically declares an interest in anti-poverty efforts but rarely invests any political capital in the issue. Democrats haven’t treated affordable housing like a touchstone project either. During their party’s primary, the only candidate to propose truly substantial housing policy reforms was former Baltimore Mayor Martin O’Malley. But there are proposals—ones that aren’t so expensive—that could reduce the housing burden on low-income families. One, which Desmond has repeatedly touted, is a universal housing voucher program. It could be a scalable and cost-effective solution to a national blight, especially if paired with rules that prevent landlords from refusing tenants with Section 8 vouchers. Such a plan would basically mean making the existing Section 8 voucher program, which currently only reaches about 17 percent of poor renters, more like one of the federal government’s easily accessible food stamp programs. Anyone under the poverty line, or some other eligibility limit, could take his or her voucher and use it to rent on the private market. The Nixon administration created Section 8 vouchers as a market-partnered alternative to traditional project-based public housing. The almost $20 billion program is meant to ensure that recipients will only pay 30 percent of their income on housing, with the public covering the rest. Reining in costs is a federally established Fair Market Rent (or FMR) figure for each metropolitan area, which is meant to limit the amount vouchers will cover if tenants move to locations with very high rent—or if their landlords try to get greedy. Families with access to the vouchers are protected against life-shattering evictions, and their landlords must keep units in relatively good condition for the inspectors who visit annually. But the voucher program only functions as a lottery for the lucky few. Most housing authorities have long Section 8 waiting lists, which are only unfrozen a couple times each decade. That’s partly because the funding isn’t based on need but on Congressional appropriations. As a result, Section 8 vouchers don’t have the flexibility to accommodate changing social and economic conditions. Instead of expanding to meet the growing need in recent years, they’ve actually shrunk due to sequestration. To actually house the number of people in need would mean more than doubling the current appropriation for Section 8 vouchers. In a 2013 report from the Bipartisan Policy Center, the cost was estimated at about $22.5 billion annually if only those below the 30th percentile for their regional median income were included. Last September, the Congressional Budget Office estimated it would cost $41 billion if those earning less than 50 percent of regional income were covered, and $29 billion if the metric were set at 30 percent. For that expenditure, we would get a new policy that would allow any family—any person—who suffers hard times a guarantee of housing. Currently, we guarantee food through the SNAP program and medical care through Medicaid, and they’re available to most people when the need arises. Under a housing voucher system, when Americans’ incomes drop below the appropriate level, they would become eligible. It would mean no household would have to spend 80 percent of its income on rent, and there would be more disposable income for, say, clothing and food (because we shouldn’t pretend that food stamps are enough). It would also mean fewer evictions, which are emotionally scarring, educationally disruptive, and cruel. An accompanying law to prevent landlords from discriminating against Section 8 users could mitigate large concentrations of voucher-holders. Costs could be reined in by basing the voucher’s funding formula on smaller geographic areas. Among other things, this reform could limit a landlord’s ability to overcharge voucher holders for rent in a poor neighborhood. The FMR measurement currently used to regulate voucher costs factors in housing costs across the region: That means a landlord in impoverished North Philadelphia is free to charge based on a formula that takes into account rents in the city’s affluent neighborhoods and suburbs. A forthcoming paper by Desmond and Kristin L. Perkins found that Section 8 households in Milwaukee are charged $51 to $68 more each month than renter households in comparable neighborhoods. That surcharge costs taxpayers an extra $3.8 million a year in the Brew City alone, money that could have provided an additional 620 families with shelter. This part isn’t just theoretical. To cut down on these practices, the U.S. Department of Housing and Urban Development has been experimenting with revising the FMR formula so Section 8 voucher values are based on a ZIP code rather than an entire metropolitan area. That would both make it harder for landlords to charge too much and, according to recent research, incentivize families to move to neighborhoods with marginally more opportunity. (It would be harder to get a larger housing unit by remaining in a poor area with the current generous regional voucher measurement). Landlords might lose the incentive of overcharging, but they would gain greater stability for their businesses: The hassle of eviction court and tenant selection would be greatly reduced because their tenants would always have rent covered, while the landlord’s income stream would be guaranteed. Fears that a universal voucher program would be a slumlord subsidy could be allayed by anti–Section 8 discrimination laws; in any case, it’s better to be housed stably in a poor neighborhood than housed tenuously. In this presidential election year, universal vouchers have only made a tentative foray onto the agenda. The only candidate to explicitly call for universal housing vouchers was Martin O’Malley, who proposed setting an eligibility limit at 30 percent of a region’s median income. None of the Republicans released a comprehensive housing plan of any kind. Hillary Clinton only mentioned vouchers in the context of tweaking them to ensure easier access to high-income areas, while Bernie Sanders spoke of a “need to increase funding for the housing choice voucher program.” It remains unclear what either major party’s platform will call for in terms of housing policy. Universal housing vouchers are Desmond’s go-to reform in his speeches, but he isn’t dogmatic on the question of policy as long as it can be brought to scale. In today’s austerity-minded environment, trying to use new construction to deal with the affordability crisis is folly. (In Philadelphia, new subsidized affordable housing is being built for $400,000 a unit.) But there are a few other policies that could be used to ensure housing for all. For one thing, in many places it is legal to discriminate against voucher holders and deny them access to housing based on their form of payment. Banning source-of-income discrimination nationwide would probably be a necessary dual reform in conjunction with universal vouchers. There are also options beyond vouchers if Republicans end up being unpersuadable on the policy. In an essay in Democracy, Peter Dreier recommends an expansion of the Earned Income Tax Credit to act as a kind of Section 8 voucher through the tax code, which could help renters cover costs without the bureaucracy of a housing authority and without substantial upfront outlays. The Center for Budget and Policy Priorities recommends a renters’ tax credit, administered by the states, which would ensure assistance to nonworking families as well. Both would offer invisibility through the tax code, eluding the stigmatization Section 8 voucher holders are often subjected to (although that might be lessened somewhat if all low-income households could use them). Regardless of which policy prescription wins the day, it’s imperative that one of them be enacted, and soon. The eviction crisis that Desmond reveals in his book is staggering in its depth—and horrifyingly racialized. (“Poor black men were locked up,” writes Desmond. “Poor black women were locked out.”) In a nation that gives so much aid to middle-class and wealthy homeowners through the mortgage interest tax deduction, it’s indefensible that millions of poor families have to live on the brink of eviction and homelessness.